At last school's out, and Emi's on his summer holidays. It feels like it's been a long time coming. I don't know about everyone else, but I'm really looking forward to not having to race around in the mornings worrying about PE kits, spelling books and packed lunches. But as the school doors closed the heavens opened. What is it with the weather? It's been lovely up until now, but yesterday it started to feel a bit cold and grey and well, ... autumnal. Noooooo! It's so not supposed to be like this. We were looking forward to blue skies and endless days of sunshine spent messing around with ne'er a care in the world. 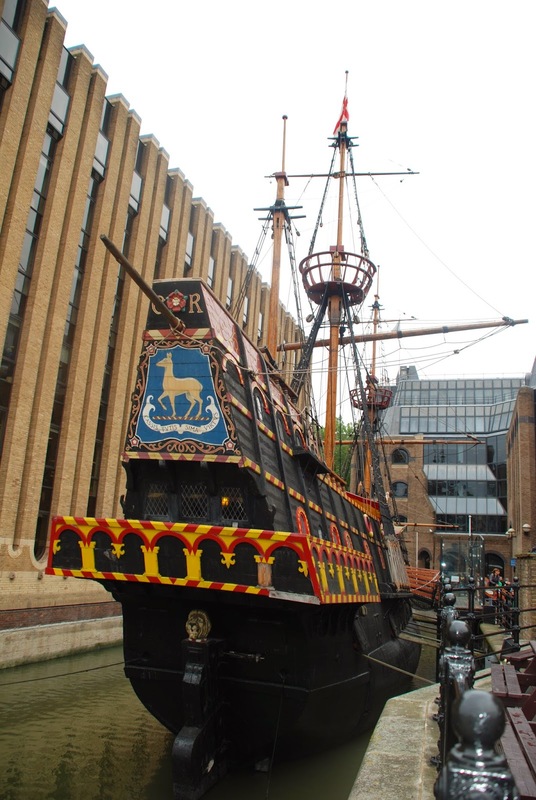 As the weather forecast wasn't inspiring any optimism on the blue skies front we decided to make the best of it and headed into town to check out the Golden Hinde II, which is docked at Saint Mary Overie Dock in Southwark, just beside Southwark Cathedral. We stopped off en route for lunch in that great foodie heaven called Borough Market. Frankly the smells were just too good to resist and, as it's just next door to the Golden Hinde II, it made the perfect pit stop. 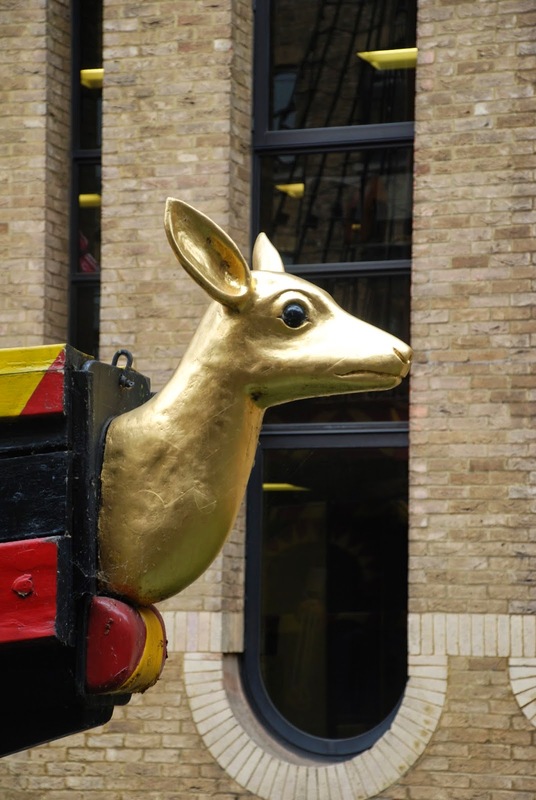 So what is this Golden Hinde II? Well, it's a full-sized reconstruction of Sir Francis Drake's famous galleon, the Golden Hinde, in which he circumnavigated the globe on an epic three year voyage from 1577 to 1580. Two Californian business men hit upon the brilliant idea of building a new Golden Hinde and sailing it to the States to mark the 400th anniversary of Drake's great voyage. Their dream ship was built down in Devon, using traditional methods and launched in April 1973. And over the last 40 years she has sailed over 140,000 miles, which is a great many more than the original ever managed. She's been back and forth to the West Coast of America, to Japan, around Asia and the Indian Ocean, down to the Caribbean. She's been through both the Suez and the Panama canals.She's been everywhere, which is kind of mind-blowing considering that she's not a whole lot different from the Drake original. Speaking as a confirmed landlubber, who thinks she's being really brave going to Ireland on the car ferry, I just cannot imagine going anywhere on this baby. I'm only 5'1", but over the course of the one hour tour I was beginning to get a stiff back from minding my head on the beams below deck, where we all had to walk bent over from the waist like a troupe of lob-sided monkeys to fit into the head-space. Emi, being 4' 6", loved it. There were lots of other children and James, our tour guide, was a complete star. He had loads of patience and plenty of banter to keep the children entertained, but totally knew his stuff when any of the adults asked a tricky question. ... although we all had to shout bang at the same time to give the cannon an authentic sound-effect. You can show up and go for a look around on your own, but the tour is a great way to keep the little 'uns interested. We took the normal guided tour, which lasts for an hour, but they also do Tudor Fun Days and Francis Drake Days, which involve dressing up and role-playing. However, I did have some reservations about Drake's mission motto: Casis tutissima virtus, virtue is the safest helmet. Having banged my head on the beams below deck so many times I'd probably opt for something in hyper-strengthened carbon fibre with a cushioned chin-strap if I had the choice, but each to his own. And, who knows, given how he spend his days nicking Spanish treasure, maybe old Sir Francis was only being ironic. oh wow, what a great ship! ahhh summer. i love it. it is so wonderful to not be on a schedule. we've been out of school since the middle of june but have to go back the first part of august. short summer this year due to school calendar change :( you get out late over there, when do you go back?